It’s the run and shoot NBA again. Thirteen teams for just the second time in the last 19 years are averaging at least 100 points per game. There are more than 20 players averaging at least 20 points per game. Last season there were nine. Contending teams like the Clippers, Thunder, Rockets and Heat are playing games to 120 points. Even the steadfast Spurs are averaging just under 100 points per game. Can defense, and mostly defense, still win in the NBA? Deng and the Bulls held the Raptors to 27.3 percent shooting in taking a 27-16 first quarter lead, and then smothered the Raptors into missing 15 of 17 shots to open the second quarter. It’s one of the big questions that will begin to come out of the Bulls game Saturday at the United Center against the undefeated Indiana Pacers. The Bulls come in finally nosing above .500 after Friday night’s dominating 96-80 victory over the Toronto Raptors. The Bulls played probably their best all around game of the season with all five starters in double figures led by Luol Deng with 19 points even without Derrick Rose, who sat out with a lower extremity issue. Rose remains listed day-to-day. But if he is sore as was stated Friday, it would seem unlikely that he’d return to play Saturday against the Pacers. “Just being smart about the situation,” Rose said. The Bulls were very smart and very aggressive Friday in dominating their situation against the Raptors to get to 4-3 on the season. The defensive effort was superb, particularly in the first half, as the switching, defensive rotations and help in closing down the middle and closing out to shooters probably gave coach Tom Thibodeau chills. The Bulls held the Raptors to 27.3 percent shooting in taking a 27-16 first quarter lead, and then smothered the Raptors into missing 15 of 17 shots to open the second quarter as the Bulls went ahead by 19 and led 45-31 at halftime. The Bulls continued to shut down the Raptors, taking a 62-35 lead midway through the third quarter before a shooting show by DeMar DeRozan with 28 second half points bruised the Bulls’ egos some. The Raptors never got closer than 14. “Smashmouth,” Raptors coach Dwane Casey said of the Bulls’ game. It was in the best of ways for the Bulls as the Raptors shot 35.4 percent overall, 23.8 percent on threes and lost on the boards to the Bulls 48-43. 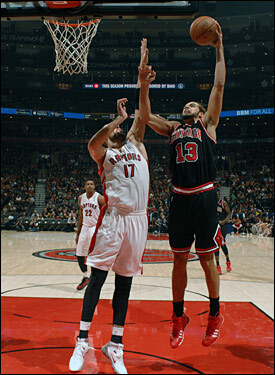 Joakim Noah probably played his most efficient and forceful game this season with 18 points and nine rebounds. Carlos Boozer was a player and playmaker with 14 points, eight rebounds and a team best six assists while Jimmy Butler had 14 points and Kirk Hinrich, starting for Rose, 12 points, though each with a pair of three pointers as the Bulls made a respectable seven of 16 long balls. Hinrich also did creative work setting up and running the offense smoothly, one of his best traits, if often unappreciated. They were vital if only to avoid a 76ers like scare from earlier this month when the Bulls blew a 20-point lead and lost on the road. This time the Bulls got their first road win after three losses and their third straight win overall. Hinrich did an excellent if, as usual, understated job as the ball breezed around early with Boozer actually in the middle and getting five first quarter assists. Perhaps the temptation is to decide that with Rose the Bulls become too isolation and dribble oriented looking toward Rose. Though you’d hardly want to try it without him for too long. “We still hang our hat on our defense and rebounding, try to cut our turnovers down and take good shots,” said Boozer. The Bulls do play somewhat slower and more deliberately without Rose, more like last season’s half court, walk-it-up team. They had six fast break points Friday to 13 for Toronto. But it was a strong all around game from the Bulls even against a team not generally expected to make the playoffs. 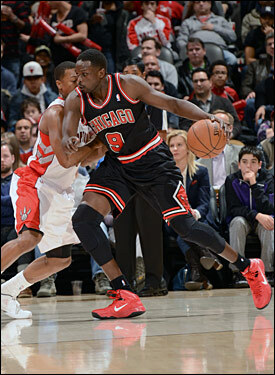 Rudy Gay, played well by Deng, had 20 points, though several late when the game was long decided in the fourth quarter. No other Raptor player was in double figures as DeRozan had 37 points, making it 57 of the 80 for the pair. But is it good enough to go where the Bulls hope to go? Of course, similarly with the Pacers in the latest statement game/measuring stick of the first three weeks of the season coming Saturday. With the win, the Bulls chute became a ladder as they rose to third in the east behind only Indiana and Miami and undefeated at home. The Pacers come in 9-0, but not composed much differently than the Bulls. Indiana is one of the lowest scoring teams in the league, 21st to 28th for the Bulls. The Pacers allow the fewest points in the league by a large margin, 84.5. The Bulls allow the third fewest. The Pacers are No. 1 in opponent field goal percentage; the Bulls are No. 2. The Pacers do have a top 10 scorer in Paul George, sixth overall at 24.9 points per game. But they have no one else in the top 40. The Bulls leading scorer is Boozer, 35th in the league at 18 per game. Each team has a pair of rebounders in the top 30. But that’s not how the league is mostly going these days. The scores are rising quickly and several teams have high level scoring and shooting options. The conventional wisdom always has been you win in the end, in the playoffs, with defense. But you see historically excellent defensive teams like Miami and San Antonio playing a higher level of offense to compete with so many fast and talented teams. 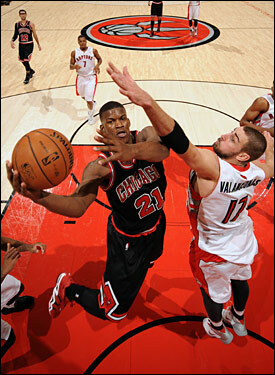 Butler and the Bulls return home Saturday to face the undefeated Indiana Pacers. Can you do it leaning so much on defense so often? The Bulls and Pacers obviously believe you can. The Bulls Friday looked every bit like that kind of team with the ball working inside to Boozer and Boozer making plays off sharper cuts and stronger screens. The Bulls with three days rest and regular practice, other than Rose, jumped on the Raptors from the start to go ahead 11-4. Boozer assisted on three of the first five baskets with passes to Deng and Noah going at the boards and the basket as intensely as he has this season, making those multiple efforts Thibodeau talks so lovingly about. The offense continued to look good with Boozer spinning by overmatched Amir Johnson with a drop step move and layup while Noah put up a nice baseline reverse past Jonas Valanciunas as the young Raptors front court took a back seat most of the game. Though Mike Dunleavy didn’t shoot well, just one of six, he showed a nice affinity for post passing, a subtle art as he found Boozer inside for easy layups. Meanwhile, the Bulls help defense was a French Impressionist masterpiece, sort of Monet doing man to man. And, man, was it difficult for the Raptors to get anywhere. It must have looked like there were eight Bulls on defense as every time a Raptors player came off a screen or cut, not that there was much team work, anyway, a Bulls big man defender was jumping in to help and cut off the drives. The Raptors thus fell into a steady stream of jump shots with the preseason idea that Deng and Butler guarding high scoring wing players would give the Bulls an increased edge. Though DeRozan got going late with an assortment of high degree of difficulty shots, the perimeter defense and help in the first half was immaculate. The Bulls did stall a bit in the second quarter after taking a 39-22 lead with a bit of over dribbling. That was after Marquis Teague departed. The little used second year man gave Hinrich a good break in the second quarter and was on the floor as the Bulls lengthened the lead. But he only played in the last minute of the game after halftime as he had four points in eight minutes. Hinrich played about 40 minutes and Deng about 38 while the other starters were between 29 and 33 minutes. The Bulls pretty much broke open the game with that early third quarter run highlighted by a nice Noah pick and roll score with Deng, and back to back threes from Hinrich and Butler as the Raptors players began mostly waving at the shooters. Boozer powered up in the post past former Pacer Tyler Hansbrough and Hinrich even floated up a teardrop that had the locals if not crying certainly booing the home team, who were more Barney the dinosaur this night than Raptors. Perhaps that’s why Thibodeau was wearing purple. The Bulls led 74-54 going into the fourth quarter after DeRozan made a pair of threes and then two more unlikely ones to open the fourth. That got Toronto within 77-62 with 10 minutes left and enough time to make it another nightmare night for the Bulls. But Taj Gibson came up with a crucial steal leading to a Dunleavy three that made it 80-62, and then several Raptors players not named DeRozan began missing shots as the team didn’t quite understand the concept of hot hand. Though that was the only shot Dunleavy made, Thibodeau kept him on the floor all fourth quarter in an indication that he apparently believes he needs Dunleavy’s presence not only to score but spread the floor to maintain offense. The Bulls did enough with a Butler putback score and Noah runner to keep the Raptors from taking the game too seriously the rest of the fourth. Though Butler was just three of seven from the field, it was more the kind of game expected from him that will help the team as he had seven rebounds and was that extra guard to crash the boards and went hard at the basket and led the team with six free throw attempts. That’s the kind of game that makes him valuable and reminiscent of the play that impressed many in last season’s playoffs.